Valentine’s Day is coming, and we at Soak Spa put together our list of the top four gifts to give to someone you love! One of the February specials, the Decadent Soak for Two, is the perfect start to your date night. This soak includes many wonderful elements, all designed for the ultimate unwinding. One of the best parts about giving this gift to your sweetheart: you get to participate! Spend quality time together in the cozy chairs and soft lighting of our Foot Sanctuary. Sip on a cup of our signature ginger tea and relax with a heated neck wrap as our aromatherapy diffuser disperses essential oils into the air. Soothing music and sounds of nature make a perfect background for a conversation while you soak your feet in our large copper bowls for 30 minutes. Bergamot essential oil: London Fog fans will recognize the citrus scent of bergamot, which is added to Earl Grey tea; bergamot helps to reduce anxiety, stress, and depression. In addition to our relaxing atmosphere, quiet space and hand-selected blend of ingredients, this soak includes 30 minutes of shoulder, neck and aromatherapy scalp massage, plus 30 minutes of leg and foot massage with shea butter. Book your couple’s soak today! The Couple’s Oasis is a 90-minute experience that begins with the Peaceful Foot Soak. As with all of our soaks, you’ll experience the tranquility of our Foot Sanctuary. The warm lighting, soft music and sounds of nature, and soothing aromatherapy sets the perfect stage for quiet time together. After your soak, you’ll head to our couple’s suite for a 60-minute, full body massage with an additional 15-minute acupressure massage for your feet. During your massage, enjoy our little touches of something extra (lagniappe) – aromatherapy, hot towels on your back and feet, and heated rice/flax seed packs. Together, you’ll leave our spa feeling relaxed and grounded. Book your Couple’s Oasis package today! Want to gift someone with a foot soak just for them? We recommend our Peaceful Foot Soak. During the soak, your special someone will relax in our comfy chairs with a heated rice/flax seed pack and a cup of our signature ginger tea. Following the soak, your gift recipient will have the choice of a 20-minute foot and lower leg massage, or a 20-minute head, neck and shoulder massage. Purchase a gift certificate for this soak today! For a gift that keeps on giving, consider the Soak in Wellness Membership, part of our Monthly Wellness Program. This allows them to choose the service they need most that month – the ultimate customized gift! One great thing about the services offered through our Monthly Wellness Program is, we don’t cut time on the services. Whether you pay individually for a service or receive one as part of the program, they’ll get the same amount of time for pampering. With a Monthly Wellness Membership, you’re simply paying less for these services. Plus, we still use heated rice/flax packs, cocoon their feet in hot towels, and offer aromatherapy. This is a wonderful gift for someone who deserves monthly self-care. Check out the details of the program and purchase a membership today! There you have it – our top four Soak Spa gifts for pampering someone you love. 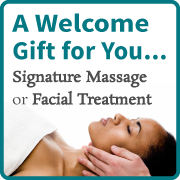 Make sure to get your gift certificates on our website, or by calling the spa at (970) 377-9868.